I tried this recipe the other day for myself when hubby was going to be late from work and wasn't super hungry after a late lunch. I ate one myself and gave the hubby the second one. He then gave our 5 year old a quarter to try. Her exact words were, "Mommy! That was AMAZING! Can you make that for my snack?!" The hubby then chimed in that it was "good... really good!!" In fact, he asked if I could make it 2 days later for lunch, AND I made it for him 2 days after that when I was heading to a meeting. Here is the recipe in case the original goes missing. Combine tuna, celery, carrots, onion, mayonnaise, vinegar, salt and pepper. Heat a large skillet over low heat. Spray skillet with oil, and place two slices of bread on top. 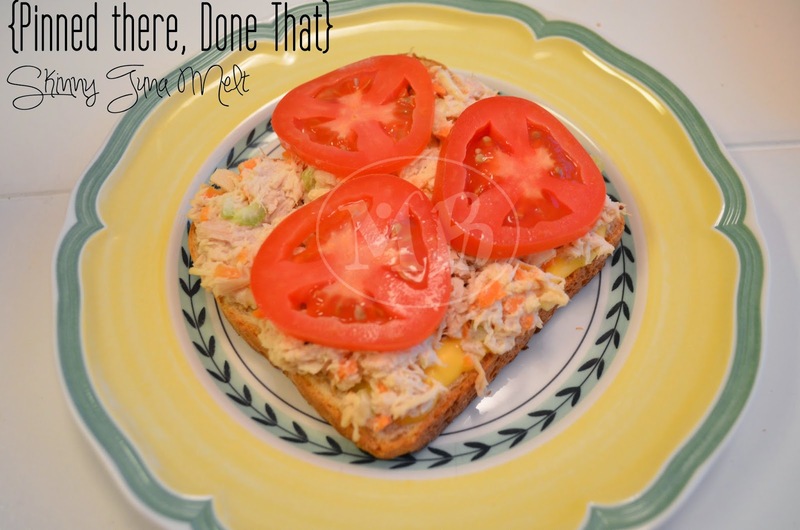 Top bread with cheese, then tuna salad and tomato. Cook on low heat until cheese melts and bread gets toasty. Serve immediately.